theEword marketing assistant Holly O'Boyle examines how a business can use Google Local to increase traffic. Setting up a Google Local account is a relatively simple process which can have huge benefits. The system allows companies to increase or improve their online presence by giving their business better exposure to large groups of conversion-likely users - those individuals searching for specific products or services. 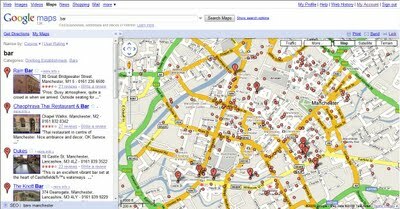 Users carrying out localised searches on Google Maps are presented with a range of red markers over a specific area. Each red marker represents a unique business related to that query. Each dot represents a business featured in the Google Local directory. Each listing can be expanded to show various details, such as address, phone number and website. The benefits of using this type of listing are obvious – companies have the opportunity to significantly increase their online presence for specific product or service-related keywords. And the geographical link allows them to identify themselves as offering those services in a particular area, making it easier for users searching from that vicinity to find them. In fact, Google couldn’t make it any easier for potential customers to garner information about companies – users can expand each listing to be given extended snippets of information, while directions, photographs and the Street View service (where available) can all be accessed in a single click. A few months ago, Google updated its search engine results pages – placing more prominence on local search results. 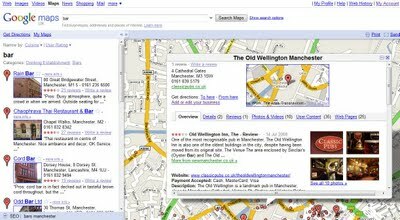 Users who search with a local term such as ‘Manchester’ or ‘Leeds’ are immediately presented with the top ten local business results for that query. As with traditional Google search pages, the competition to feature in this list is fierce. Recent studies have shown that Google places more weight on businesses which have a strong digital presence - companies with an optimised website which includes SEO content, a good keyword spread and plenty of strong inbound links. These sites are ranked higher in Google Local as well as in search engine results pages. TOP TIP: There are a number of steps businesses can take in order to optimise for a Google Local ranking. These include using keywords in the Google Local listing or ensuring that they register in the most accurate and specific category possible. Read more guides on theEword SEO Manchester website.